Our scratch brush offering includes the curved long handle and shoe handle styles in both carbon and stainless steel. These are staple-set in wood blocks to provide long lasting and efficient service at a low cost. These are excellent for light scale removal. 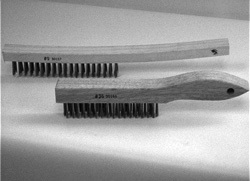 Also available are the small hand scratch brush in the toothbrush style construction. These are supplied with both stainless and brass wire. They are preferred in tight areas for small parts and soldered joints for rust, contaminants, metal burrs, paint and varnish removal.